A recent comment made on this blog posed a question that had been troubling me as well, particularly because I am currently in the process of assembling a travel kit for a two week trip to Spain and Portugal. It has to do with making a decision between the Fuji 10-24mm f/4 zoom and a single prime wide angle lens, such as the Zeiss Touit 12mm or Fuji 14mm, both with faster f/2.8 apertures. "Hey Tom, between the 10-24 and Zeiss Touit 12 2.8, which would you recommend? I'm leaning towards the fuji 10-24 as it gives 15mm on the X-E2 whereas the Zeiss would be 18mm, but the f2.8 and image quality of the Zeiss is very tempting." Normally this would not be a too difficult a decision because super-wide zooms typically do not deliver the same image quality as a single super-wide prime. Fuji made the decision difficult by delivering such an excellent zoom with its XF 10-24mm f/4 R OIS Lens. So the decision comes down to a comparison between focal length preference, size and weight, aperture, and price. Each of these qualities (except for price) depends on how the lens will be used. Let's look at each element separately. Unlike longer lenses, the differences in focal length between super-wide angles varies greatly with just a few millimeters difference. A 10mm focal length has an angle of view equal to 110°, whereas the angle of a 14mm is 89°, and a 12mm is 99°. This is a considerable difference and one that depends upon personal preferences and usage. Personally, my favorite full frame super-wide angle focal length has always been 21mm, which is the same as using 14mm on an APS-C camera like the Fuji X-series. That said, there are times when I appreciate the exaggerated sweeping effect of something much wider. Nonetheless, in most circumstances I find I can make due with a fixed prime super-wide simply by adjusting my distance slightly. 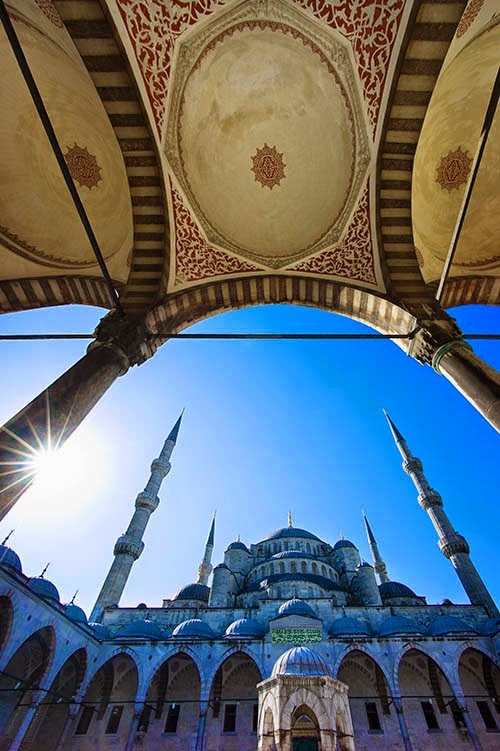 This photo of the Blue Mosque in Istanbul was taken with a 21mm lens on a Leica M-9. This would be equivalent to using a Fuji 14mm and is typical of the what I want to achieve with a super-wide lens. An even wider angle might have taken in more of the scene, but I doubt it could have made the final image any more dramatic. If you plan on shooting indoors a lot with available light, then the full stop aperture difference between f/2.8 and f/4 could make a difference. Doing a travel shot handheld inside a dark cathedral, for instance, could mean the difference between using an ISO of 1600 and 3200, and on a large print that would be considerable. For more general outdoor photography a faster aperture on a super-wide lens does not make much of a difference. In most instances, particularly in landscape photography, we are going to want to stop the lens down for f/8 or even more to maximize depth-of-field, a quality in which a super-wide excels. For anyone lugging around a heavily equipped camera bag all day while walking through a city, this could make a difference. The Fuji 10-24mm zoom is considerably larger and bulkier than the other two primes and takes up a large chunk of space in an already too-cramped camera bag. Here is where you might appreciate going with a single fixed prime. Recent deals on lenses for the Fuji X-series -- particularly the huge savings offered by Zeiss on its Touit lenses -- have equalized pricing to a point where it is not currently a large factor in choosing one over the other. In the end the deciding factors come down to how the lens will be used. Indoors and hand held argue for a fast aperture. Landscapes, where fast aperture is not a factor, argue for the flexibility of a zoom. Travel, where portability comes into play coupled with some hand-held interior shooting, argues for a smaller, fast aperture prime. My full review of the Fuji 10-14mm zoom can be read here. My full review of the Fuji 14mm lens can be read here. My review of the Zeiss Touit 12mm lens can be read here. If you are planning on purchasing any of these lenses, you can help support this site at no extra cost to you by purchasing from one of our affiliate sellers listed below -- and thanks for your support. i have both of these fuji lenses. i thought i would sell my 14 when i bought the 10-24, but that 14 is SO much smaller, a bit sharper, and of course much lighter. i sometimes need a wider lens, and so can't bring myself to sell either. AND i have the 23 1.4, also covered by the zoom, and not that small… but… a nice lens and ultra fast. i wish fuji made a 23 f2, which would be very small… my fave lens, just for form factor, is the 35 1.4, what a perfect size. Fuji DOES make a 23 f2 - when you buy it you get a free camera with it, the X100S…! You're right, and that is what I meant, but, perhaps I did not state it too clearly. I re-worded the sentence and hopefully that expresses it better. I simply meant that a 14mm lens on APS is equal to 21mm on full frame. Ah, got it. Thanks for the helpful reviews.